My husband has traveled on business for years and many of my patients are flight attendants. They can tell you, it can be tricky to find a balanced and nutritious meal choice at the airport! But with a little pre-planning, you can stay tuned in to your food options in order to stay in good shape and arrive at your destination feeling the best you can. 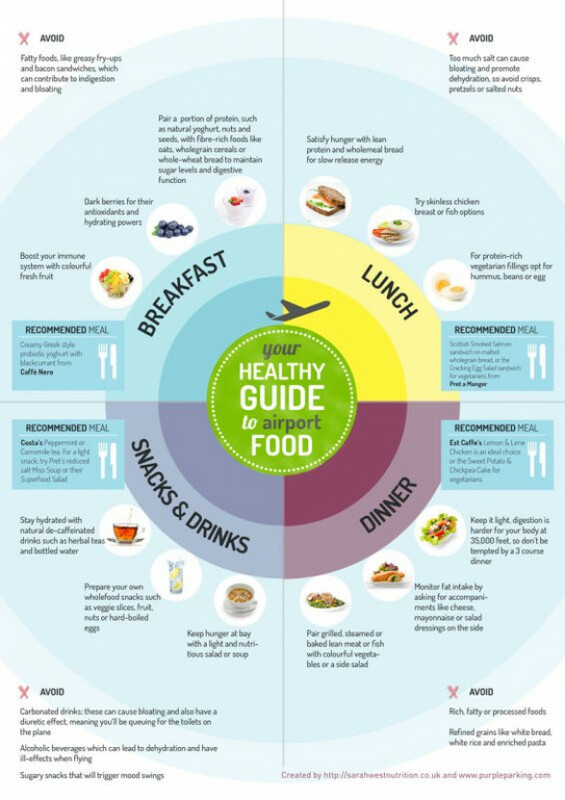 Here is a handy guide to put in your back pocket with the best food and drink options to choose when flying. It includes tips for breakfast, lunch, dinner and snacks and makes life easy with top recommendations for meals available at main airport restaurant chains. The guide was created by Purple Parking with the help of nutritionist Sarah West.